Who has the better driver promos, Lyft or Uber? Lyft and Uber are locked in a market share battle. So far, Lyft is winning 2017 hands down, more than doubling the number of rides given in 2016 while continuing to eat into Uber’s market share. Uber still has a larger overall market share, but Lyft is continuing to gain. Part of the reason for this has been the continued uptick in the number of people taking Lyft over Uber, partly due to Uber’s ongoing PR troubles. The battle between Lyft and Uber also extends to recruiting and retaining drivers. Lyft and Uber currently offer numerous driver promos and sign up bonuses to entice new drivers. They also offer weekly guarantees to new drivers to keep them on the road. So, who has the better driver promotions, Lyft or Uber? Uber currently offers two types of driver promotions. The first type is the Uber driver sign up guarantee. The second type of promotion is the Uber driver weekly incentives. The second type of bonus is available to new and existing Uber drivers. However, the weekly bonuses tend to be higher for new drivers. Unfortunately, Uber is no longer offering new drivers a cash sign up bonus. The Uber driver promo sign up guarantee varies by city and goes up to $1025. It works like this. Uber will guarantee a new driver a certain dollar amount for giving a certain amount of rides. For example, Uber may offer a new driver in Miami a guarantee of $800 if they complete 90 rides. If the driver gives 90 rides, but only earns $700, Uber will give that driver $100. While this is not technically a sign up bonus, it does provide new Uber drivers a guaranteed income, if they complete a set number rides, usually with 30-60 days. The driver must also maintain a high acceptance rate, usually 90% or higher. In addition to their sign up guarantee, Uber also offers new and existing drivers two weekly bonus oppurtunities. The first weekly guarantee usually runs from Monday – Thursday. Uber may offer a driver an extra $110 if they complete 45 rides between Monday and Thursday. The second weekly guarantee runs from Friday through Sunday. Uber may offer a driver an extra $125 if they complete 55 rides during that time. If I driver were to complete both bonuses, they would earn an extra $235 on top of their regular earnings for the week. The amounts of the bonus and the rides required vary by driver, by city, and change from week to week. In general, newer drivers and full time drivers tend to receive the most lucrative bonus incentives. Lyft currently offers four types of driver promotions. The first type of Lyft driver promo is the Lyft sign up bonus for new drivers. The second type of Lyft driver promo is the Power Driver Bonus, which is available to new and existing drivers. The third type of Lyft driver promo is the average hourly guarantee. The last type of Lyft driver promo is the weekly guarantee, also available to new and existing drivers. The Lyft sign up bonus ranges from $50 to $1000 (in a few select markets, the Lyft sign up bonus may be even higher). The Lyft sign up bonus varies by city and is a per ride bonus. What that means is that your Lyft driver sign up bonus begins paying out immediately. For example, Lyft may offer a new driver in San Diego a $600 sign up bonus. The bonus will pay a new driver an extra $4 on every ride for the first 150 rides (150 x $4 = $600). The total amount of the Lyft sign up bonus as well as the per ride amount will vary. Generally, the higher the bonus amount, the more rides the driver is required to do to get the full bonus. Also, the higher bonus levels often have a lower per ride bonus amount. 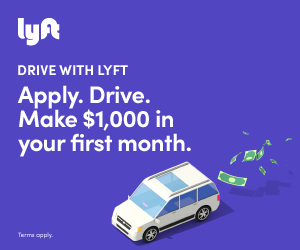 Earlier this year, Lyft had a promotion in Philadelphia that offered a new driver $1500 if they completed 600 rides in their first 90 days. That comes out to a per ride bonus of $2.5. The current Philadelphia Lyft sign up bonuses tend to be lower, in the $300-$700 range, but offer a higher bonus amount per ride. The Lyft average hourly guarantee is offered in certain markets. Basically, if you driver certain hours, maintain a 90% acceptance rate, Lyft will guarantee you a certain hourly amount. For example, Lyft may offer drivers in Boston a $30 per hour guarantee during certain hours. The requirements are usually that the driver be online for at least 50 minutes during each of those guaranteed hours, and maintain a 90% acceptance rate. Drivers must opt-in to these guarantee amounts. Also, the guarantee amounts are before Lyft takes their commission. So, say Albert opted in to a $30 per hour guarantee in Boston. The guarantee is for ten hours, 9am – 2pm on both Saturday and Sunday. Albert drives those hours, but only earns $230. Lyft will credit Albert an extra $52.50 ($70 – 25% commission = $52.50). The Lyft weekly guarantee is offered in certain markets and is similar to the average hourly guarantees. Basically, Lyft will guarantee a certain amount to a driver. The driver must maintain a 90% acceptance rate, complete a set number of rides, and driver a certain number of hours. For example, Lyft may guarantee a driver in San Francisco $1000 if they complete 90 rides over 40 hours. If the driver only earns $800 while fulfilling those requirements, Lyft will make up the difference. By far, the most lucrative ongoing Lyft driver promo is the Power Driver Bonus. Lyft offers incremental bonuses each week based on the number of rides a driver gives. To qualify for these bonuses, drivers must give a certain number of rides overall, and during peak hours. Usually, there are four Power Driver Bonus levels. The first level may pay a driver an $80 bonus if they complete 35 rides in a week with 15 of those rides occurring during peak hours. Peak hours are during rush hours, and weekend evenings. The second level Power Driver Bonus may pay a driver $160 if they complete 75 rides in a week with 25 during peak hours. The top level Power Driver Bonus may be for $350, requiring the driver to complete 125 rides in a week with 40 during peak hours. Part time drivers can usually reach the first level bonus and sometimes the second level, but to reach the top two Power Driver Bonus levels, you have to drive full time. Lyft currently has the better driver promos. Lyft Car Requirements - Does Your Car Meet The Lyft Vehicle Requirements? Final Take – The Lyft Driver Promotions are currently better. Once you’re signed up to drive, the various driver promotions offered by Lyft and Uber are about even. Whether you’re driving for Lyft or Uber, you can probably take home an extra $200 – $400 per week by meeting the incentive targets. However, the Lyft new driver promo is an actual sign up bonus for new drivers. Uber, on the other hand, is only offering a sign up guarantee. In other words, a new driver doesn’t actually get a sign up bonus on Uber. They only get a guarantee that they will make a certain amount if they complete a set number of rides. The problem is that if a new Uber driver does those rides, they will usually hit the guarantee amount anyway. On Lyft, the new driver promo actually pays the driver more for each ride. The per ride amounts are usually between $1 and $5, and are paid on top of the earnings for that ride. Because of the initial sign up bonus, Rideshare Central judges the Lyft driver promos to be superior to the Uber driver promos.